Colleen Clayton | YA? Why Not? 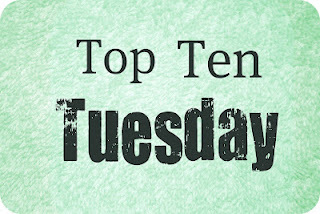 This week’s Top Ten Tuesday, hosted by The Broke and the Bookish, is all about authors we would like to read more from. Whether they are debut author who needs to hurry up and write more books, or a new-to-you author with many books to their name, these are people we plan to follow after getting a taste of their work. 1. Ernest Cline. I loved Ready Player One and can’t wait to check out Armada. 2. Trish Doller. I really enjoyed her second novel, Where the Stars Still Shine and need to go back and read Something Like Normal. Her new book, The Devil You Know is also on my TBR list. 3. Morgan Matson. Amy & Roger’s Epic Detour is one of my favorite road trip novels. I can’t bring myself to read Second Chance Summer (I have a self-imposed, life-time ban on all cancer books), but I really want to read Since You’ve Been Gone. 4. Danielle Paige. 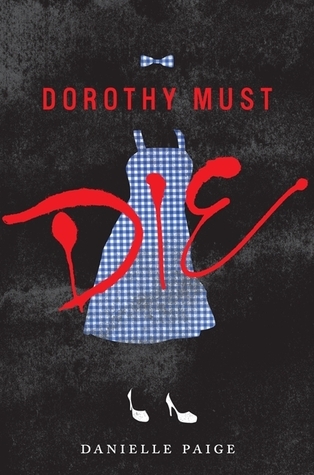 I loved her debut, Dorothy Must Die and can’t wait for more of the story! 5. Tess Sharp. Another debut author. After reading Far From You I knew she was going to be an author to watch. 6. Jennifer Brown. It has been years since I read her debut, The Hate List. I have gone on to add every one of her subsequent books to my TBR list as they are published. I have a lot of catching up to do! 7. Cat Winters. I *might* be just a little obsessed with her debut, In the Shadow of Blackbirds. I kind of need A Cure for Dreaming right now. 8. Colleen Clayton. I am so happy that I read her debut novel, What Happens Next? Ms. Clayton is a local author and she was kind enough to come to my library and speak about bullying. Before the event we had dinner together and she talked about one of the projects she is working on and I want more! Please! 9. Gavin Extence. His debut, The Universe Versus Alex Woods, was a wonderful and moving story and I will eagerly await a new release from Mr. Extence! 10. Benjamin Alire Sáenz. Aristotle and Dante Discover the Secrets of the Universe was the first book by this author that I read. He has many, many books to his name and would like to read more from him. Daniel O’Malley-Please hurry up with a sequel to The Rook! Nick Lake–In Darkness was awesome! Hostage Three is on my TBR list. Happy Monday! I am really excited about a program being held at the library this evening. At 6 p.m. we will be showing a screening of the documentary film, Bully. The film follows five families over the course of a school year as they cope with bullying. Following the film local author Colleen Clayton, author of What Happens Next?, will speak about her experience with bullying. She will also talk about and sign copies of her book. Books will be available to purchase at the library. I hope to see a full house tonight, so please consider joining us! 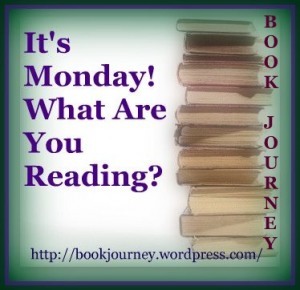 I feel like I have been in a reading slump for a while, so my Monday check-in is pretty slim. 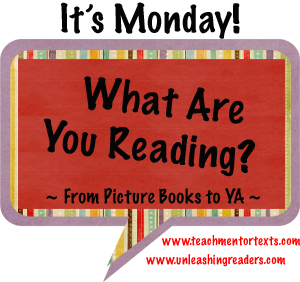 Be sure to check with Book Journey and Teach Mentor Texts for more great It’s Monday! What Are You Reading? lists. The Returned by Jason Mott examines what would happen in the dead began coming back to life. This is not a zombies/undead situation. This is the dearly departed no longer being departed. It’s crazy. This book has getting a lot of buzz and it all well-deserved. I devoured this in a couple of sittings. Another book that I couldn’t put down was In the Shadow of the Blackbirds, a debut novel by Cat Winters. Set in 1918 at the height of World War I and the Spanish Influenza pandemic, Mary Shelley Black watches with skepticism as people flock to séances and spiritualists in an attempt to make contact with their deceased loved ones. She is forced to rethink her views when she herself is haunted by an unsettled spirit. I loved this one! At the suggestion of a friend, I picked up an oldie, but a goodie, The Girl With the Silver Eyes by Willo Davis Roberts. 10-year old Katie not only looks different, with her unsettling silver eyes, she also has a very unique talent. She can move things with her mind! This was a really fun middle grade science fiction and I am glad I took my friend’s advice. Finally, I finished listening to At Home, by Bill Bryson. I loved this history of the world as seen from the perspective of the home. This was actually my first experience with Bryson and will definitely be adding more of his works to my TBR list. I am almost finished with The Wells Bequest by Polly Shulman. This companion to Shulman’s The Grimm Legacy is a fun time-travel adventure! Readers will return to the New-York Circulating Material Repository and explore the person collection of H.G. Wells, which includes a shrink ray and a time machine. I am also continuing my nonfiction audio streak with Gulp: Adventures on the Alimentary Canal by Mary Roach. So far this is a hilarious and insightful look at the science of eating, starting with the noses and ending, well, I haven’t gotten that far, but you know where things we eat end up! I am still working on Rose Under Fire by Elizabeth Wein. It’s getting to be shameful. I really need to commit. I am also dabbling with Monsters by Ilsa Bick. I am taking this one slow in purpose…it is so disturbing! I also picked up Notorious Nineteen by Janet Evanovich. A Stephanie Plum novel is always a good thing to have around when I am struggling with my reading. I actually am a little surprised that I have not jumped right into United We Spy! But I have been busy and distracted lately and really want to savor it. I hope to find some time this week to dedicate to the final Gallagher Girls book. I also want to start my ARC of Simone Elkeles’s new book, Wild Cards. I am really excited about this one!